Disneyland recently celebrated several classic attractions that have been updated in preparation for Star Wars: Galaxy’s Edge. The park officially reopened the Disneyland Railroad and Rivers of America boats that skirt the footprint for the new land on Saturday. I was there to check it all out firsthand. The highly anticipated Star Wars: Galaxy’s Edge will not be inaugurated until 2019, but its effect on the park is already so great that the river and railway which originally opened with the park in 1955 had to be modified to make room for it all. In fact, the Rivers of America was shortened in length, and Tom Sawyer’s Island at its center was clipped smaller. Additionally, the former Big Thunder Ranch at the northern edge of the park was removed entirely, and the train's path that once outlined the perimeter of the park was drawn inward. The train now rolls inside of not only Mickey's Toontown as before but also what will become the new Star Wars land. In fact, because it takes such a radical new path, the train even makes a left turn for the first time in its history to reconnect with the existing track after bypassing Galaxy’s Edge. Making such a dramatic change affecting so many classic rides could very well have damaged the look of the park in this region. 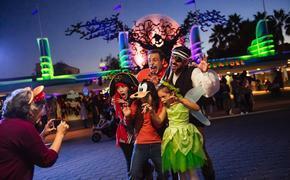 However, as only Disney can do, the modifications actually “plussed” all the attractions. After a year of being closed, my annual pass-holder wife and I were getting antsy to see everything reopen, and we were thrilled upon first riding the rails again. After passing the Hungry Bear Restaurant in Critter Country, the track opened up to a brand new section that now immediately lines the northern banks of the river. This stretch serves as a new berm to divide the bulk of the park with Star Wars; three new trellises bridge over a trio of entrances to Galaxy’s Edge. A fourth also spans a hidden storage area for “Fantasmic!” show support. The total effect is a new range of intricately-detailed rock-work to the left as waterfalls descend below and to the river on the right. New trees and other foliage dot the wilderness as old and new American Indian and animal figures populate the landscape. Newly located is the original tribesman on horseback waving to passersby on both the trains and riverboats. Most impressive is a new storyteller figure—a fully articulated Audio-Animatronic. Altogether, the Indian village and combination of kinetic and static animals does a fantastic job of infilling the entire scene. The topography is perfectly varied, making for a taller setting than was initially expected. Even across the way, the once burning cabin (for effect only) has been rebuilt from the looks of it. On the rivers itself, the Mark Twain Riverboat and Sailing Ship Columbia have also returned as well as Davy Crockett's Explorer Canoes. We managed to sneak on the last Mark Twain sailing for the day from which we saw our favorite tableau on the river. It would seem a mischievous beaver is already making quick work of “gnawing” through a couple of train trellis pylons. It’s an amusing river scene for sure. Back on dry land, it’s fun to now walk all the way up to what will eventually be the portals into Star Wars: Galaxy’s Edge. One will come off Big Thunder Trail shortly past Fantasyland, another from Frontierland itself and a third from Critter Country. Admittedly, my only complaint about the new changes is that in order for the latter path to reach the new land, a boardwalk had to be built in front of the once waterside patio of the Hungry Bear Restaurant. Now the previously quiet retreat sits behind a pathway that will soon be flooded with people. Nonetheless, walking up to these transition areas is fascinating as the rock-work gradually becomes more otherworldly. Even props and railings become more eclectic leading to what will be futuristic. They serve as a small preview of what can be anticipated and, given how masterfully executed this interim project was, I can only imagine how incredible the completed main objective will be behind. In the meantime, the new layout is interesting: How the train now passes so close to Big Thunder Mountain Railroad that it can be seen rolling near the roller coaster while riding it. The thrill ride is also a great way to view the construction of the Star Wars land beyond as it begins to tower higher in preparation for its monstrous rock work that will beckon guests to its own attractions. 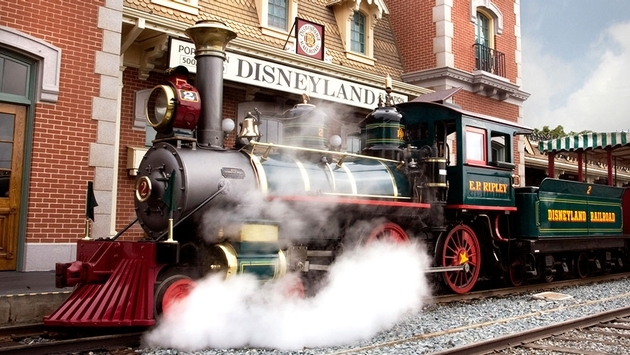 Taking the Disneyland Railroad on its grand circle tour will reveal other modifications farther away. The Grand Canyon and Primeval World dioramas approaching the Main Street station have been spruced up quite a bit as well during the train’s downtime. New effects enhance the scenes to a surprising degree. Static murals are now brought to life with animated projections that introduce weather into the scenes, and updated lighting and painting bring increased realism. The first dinosaurs under blacklight appear almost bioluminescent—taking cues perhaps from artistic lessons learned at Pandora – The World of Avatar in Walt Disney World’s Animal Kingdom. Projections here also further add to the new dynamic visuals. These old scenes were not aging well, but the fresh technology gives them a new lease on life. It may just be my imagination, but it even seems like the final battle between the tyrannosaurus and stegosaurus has been restaged to give it better viewing time before the trains steam away. All in all, I couldn't be more pleased with how the enhancements to these classic attractions turned out. Now, even more than before, I can't wait to next travel to Star Wars: Galaxy’s Edge.